Submitted by Adrian Brown on Tuesday, May 15, 2018 - 07:12. Top-down and side-on gauntlet-ish game, played in an alien infested base. Hooray!! Scream from the highest mountain, and relish in a NON-PUZZLE (in massive capital letters) game from the non-puzzley lads at Jupiter Software. Now you have the chance to power-up on weaponry, shoot the living daylights out of assorted alien foe and basically enjoy yourself! Amalthea is a seven (SEVEN!) multi-load game involving two different game styles - a top-down style game, which has a certain "Alien Breed" about it, and a much-polished (erm, thanks to my graphics, ahem) side-on viewed section, but cleverly involving the same elements of the top-down game, but in a different layout. The game kicks in with a Alien Breed-style "mission printout" telling you about each of the seven zones. In all cases, you have to collect power crystals dotted around each of the zones and then find the exit (a skull and crossbones before you've collected all the power crystals) to escape. 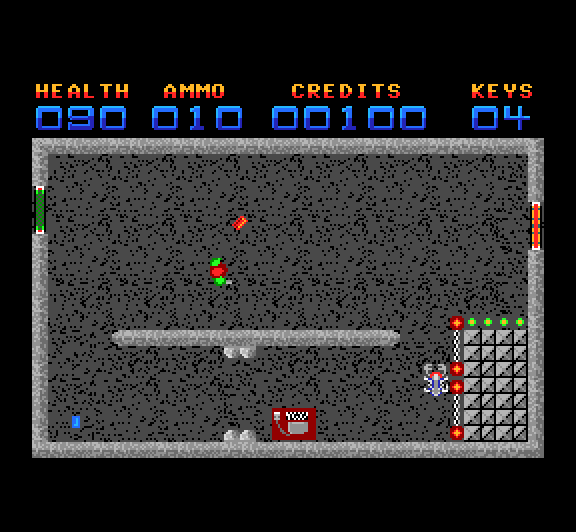 Along the way, you can collect a multitude of various odds and ends including multi-coloured (and multi-valued) credits which can be used at a computer terminal in each zone to buy weapon power-ups, first aid, etc. First aid icons can be found to increase your health, while ammo is for.. go on, guess. 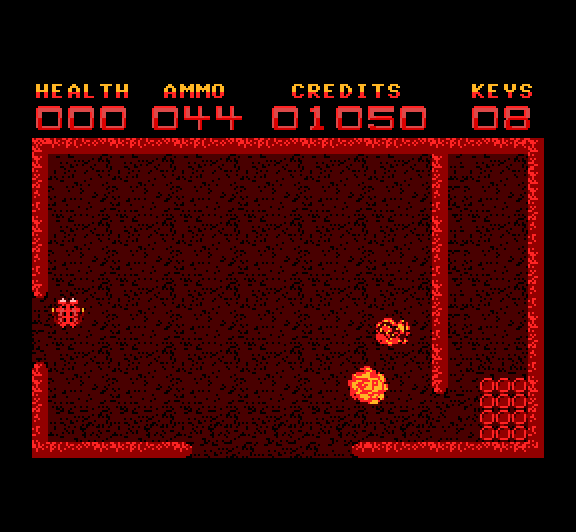 Various sections of the complex can be accessed with the help of keys, key icons of which can be found around the game zone, and generously allow you to open five doors. Alternatively, you can always blast a door open with your weapon (no sexual innuendo intended, you dirty minded person). Weaponry, by the way, can be upgraded to include more powerful shots, and even two guns for the price of one - at a price of more ammunition needed! The aliens aren't as feriocious as Alien Breed, as they mostly move in set patterns. Some aliens are "triggered" to attack you when you collect a certain icon in that room, and all aliens take a fair amount of shots to destroy. 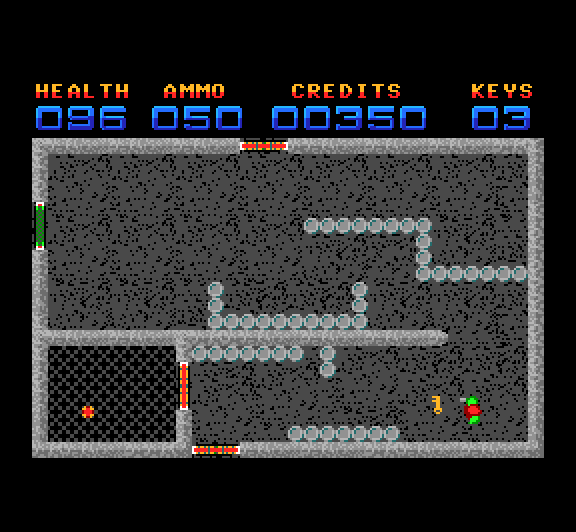 The side-on viewed level certainly throws the player, though the gist of it is very simple to get into, and the boys at Jupiter have definetly giving the side-on view a new buzz from this game, with the advent of several dangers including vertical lifts, lifts that can only be activated when you have destroyed a main "switch", barrels of toxic waste which eat at your health, plus all the usual add-ons from the top-down levels. Each zone alternates from one game style to the next, and as you progress through the complex, you're treated to even more dangers to face, including attacks from gun cannons (when the defence system has been activated), and much more. By the way, as the levels progress, each game zone gets larger and larger, and in many cases, there are even secret entrances to be found! One minor gripe is that once a level is completed, your health, ammo and anything else you have, is "kept" for the next level, so if you had just scraped through a particulary dangerous level then you'll find that your health of 3% won't last long in a particularly dangerous part of the zone. 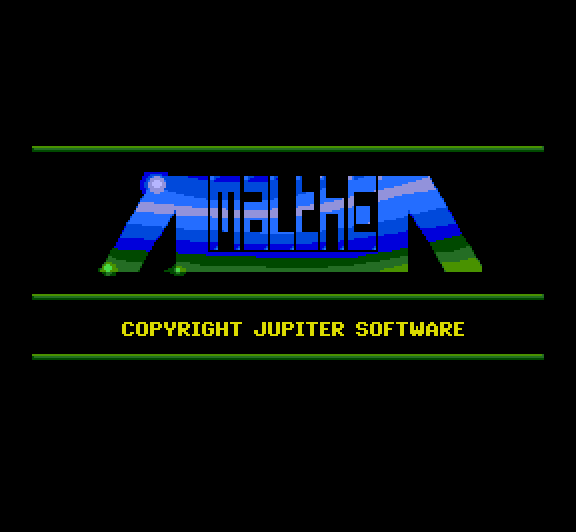 But saying this, the game does prevent over-use of the multi-load feature by keeping you on the game zone you last died on, and taking off a few hundred credits - top marks for Jupiter there! 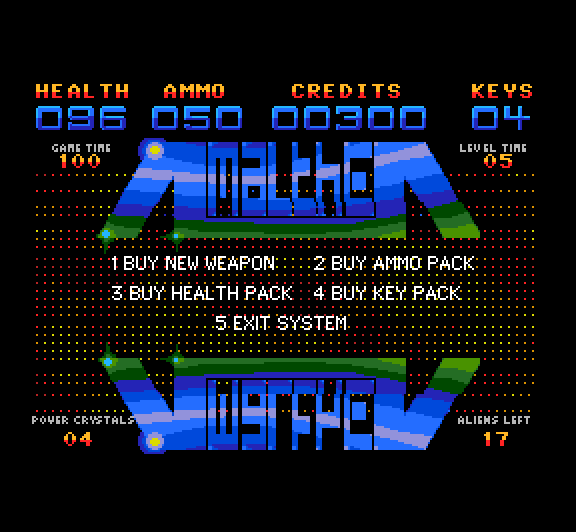 In short, if you want a bargain of a buy with tons to do, a lastability you won't believe, eye-popping graphics and a totally engrossing atmosphere, then get this! Puzzle games - your days are numbered...! 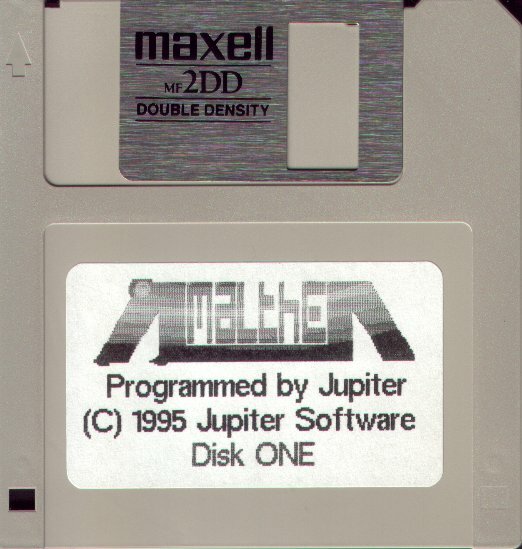 Amalthea was the first Sam game to feature support for the Quazar Surround soundcard, with well over a megabyte of samples in the introduction and spot sound effects throughout the game.